Help Dumfries celebrate the birth of Robert Burns and make this the Biggest Burns Supper ever. This exhibition describes the friendship between Robert Graham, 12th Laird of Fintry in Forfarshire, and Robert Burns. Tuesday - Saturday 11am - 5pm (Admission Free). Edward Atkinson Hornel (1864-1933) was a member of that loose association of young Scottish artists active towards the end of the 19th century who we now know as ?the Glasgow Boys?. 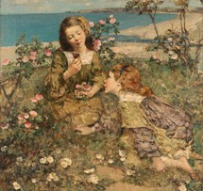 Along with his close friend and collaborator, George Henry, Hornel was arguably among the most experimental of the painters within this group. A dramatic tale of how our intrepid Ranger got lost in the jungle and found himself stranded far below the earth in a deep, dark cave. This exhibition reveals the story of Dumfries Dock. An exhibition to commemorate the centenary of the death of the celebrated mezzotint engraver and Galloway artist James Faed.